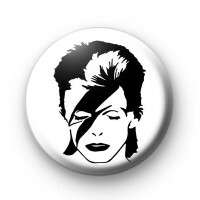 Ziggy Stardust inspired David Bowie badge in black and white. Perfect for fans of the great David Bowie. Standard 25mm button badge made from metal badge components with a copper pin back.